It's very very rare that I buy clothing from the mall or store anymore. If I do get a shopping bug then I'm prone to thrift rather than anything else and lately the thrift store has been really picked over. Meh.... I was on my way home from the thrift store after finding nothing but a couple of belts (sigh) and spotted a consignment shop that I had long wanted to go into and never had. I thought the next best thing to the thrift was consignment and boy I was surprised at how much nicer it was than I had even thought. Consignment, of course, is carefully curated and so it was that I entered this pretty fabulous consignment shop not too far from where I live. I was amazed at what they had. Never had I seen such beautiful second hand offerings. This jacket is, quite literally, perfect. It's loverly. And I wanted to show it all to you because I thought you might find it interesting from a sewing standpoint. The really unique thing about this jacket is that its 100% silk, through and through. To boot, its quilted. I don't know about you, but whenever I think of a quilted jacket, I think "quilty" and that involves something crazy like patchwork. 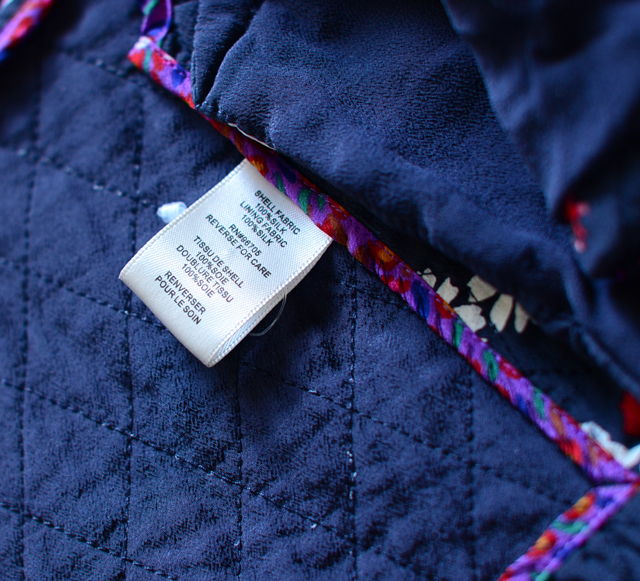 And you know, for a jacket, I don't know that quilty is so great, or at least I never thought it could be so great or so incredibly sophisticated. So anyway, yeah, this jacket is quilted. Quilted silk. Crazy right? The sleeves are lined in silk and at the sleeve vent (if you will) there is a zipper. Additionally, at the sleeve cap there is a curious addition which gives this jacket the half look of a moto jacket style. But then there's the peplum which gives it a crossover into riding jacket territory. Personally, I find it gorgeous and it doesn't help at all that its amazingly comfortable. The inside has some hong kong finished seams which only add to the overall beauty. Its seriously exquisite and quite candidly I find this amazing because what I had previous thought before was high end RTW (ready-to-wear) was really not what is high end RTW. I mean I've felt that I had some nice RTW items that did cost me quite a bit back in the day, but I've never come across a silk jacket. Especially one that was lined in silk too. Usually linings are polyester or acetate which is so awfully sad, but true. I read an article in one of the more recent Threads mags that talked about picking the right fabric for the right pattern. The article was really well done and right at the beginning, the author stated something to the effect of "there really is not bad fabric, only inappropriate fabric choices for specific patterns." Though I do have to state that I think polyester double knit is a really bad fabric and I have yet to hear of or think of a good application for this fabric, I do think that statement holds true. But what about when you are completely surprised by the fabric choice of a particular garment? This jacket is one of those instances, and yet thoroughly well executed. Anyway, spiffy right? What do you think? 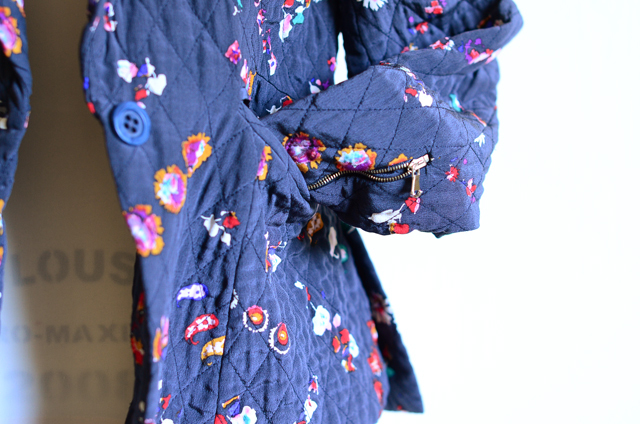 Have you ever thought that a jacket could be made of out quilted silk? It kind gives room to the imagination as regards sewing and creating your own silk jacket. I mean I never would have thunk, which is the whole reason why I wanted y'all to see it. You know, from sewer to sewer, just giving you ideas. Thoughts, anyone? That is one gorgeous jacket. I wish you could magically send us all one in our sizes. All silk, Hong Kong seams, & gorgeous material. WOW!!! Thank you for the post. Is this your jacket on Lauren Conrad? Looks like it. What a find! It's beautiful, but I'd love to see it on, just to get a better idea of how it fits. Fabulous jacket. Wow... Isabel's link lists it on sale for $255, down from $450, and it's no longer available. Great find! Lovely jacket. I just love it. That is an amazing find. It is so gorgeous and I'd love to see it on you, soon! What inspires me is to learn and use Hong Kong seams. I just made an Anna dress from Kaufman Brussels Washer Linen (ridiculous name for what is basically linen/cotton) and the dress is so beautiful outside but inside is a NIGHTMARE. Since it isn't lined, it calls for fancy seamwork. Your jacket is beautiful. I would sleep in it. I have never seen a quilted silk before. But, I love the inside finishing-this jacket is going to be a joy to wear. I love consignment shops. The prices are a bit more but the quality is always great. Great Jacket, I used to find some great clothes in Dallas at consignment stores. I enjoy your e-mails very much. They are factual and fun at the same time. I think you should work on creating a similar project to share with us. You are very talented and I know we could learn a lot. That is just stunning - I'm so glad you went ahead and bought it! I really appreciate the close-up shots too - so inspiring! Thanks for sharing too, always nice too see good craftsmanship and pretty things. Gah! How cute is this?! I louvre! its so gorgeous! 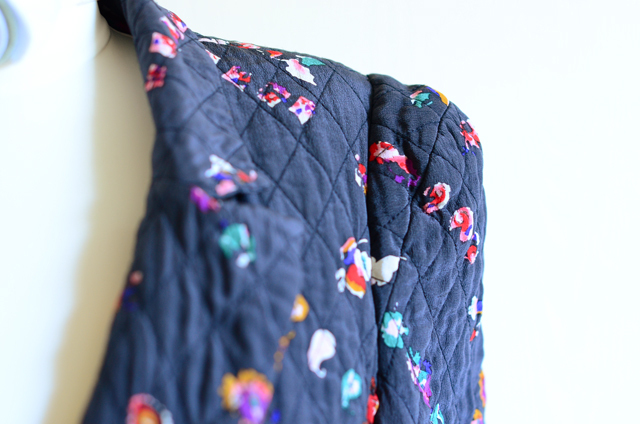 i have a little crush on quilted fabric all of the sudden. Total Score! Wowza. I am seriously thinking how fun it would be to make something similar, dying my own silk to get there. Hey, I was wondering if you could give the name of the consignment shop you acquired this beauty at? I live in SLC and would love to check it out. The title says it all - this is a great score. It is such a beautiful jacket and I loved reading about it. The inside is very pretty too! And as it's made of silk, it must be wonderful to wear. This is an unusual piece, beautifully made. Silk, quilting, quilted jackets. That's very Asian to me, specifically Chinese. I can recall seeing lots of photos of Chinese peasants in quilted jackets, usually of a more boxy shape. So it's a westernised silhouette, but the fabric choice isn't so random when you think about it from an Asian perspective. Love how all these references get rolled in together in good design! One of the things that puts a brake on my buying impulse is the poor workmanship - even in top designer labels. I love the fact that your jacket has bound seams. Its a cut above! It is really pretty. I love to see RTW that is not all synthetic disposable clothing,It was interesting to see the hong kong finish and I was surprised that a quilted jacket could look so refined. Wow, those seams are stunning!!! Love. I've never seen anything like it! I bet it looks gorgeous on you! I am a real fan of consignment shops - I have sold all my "corporate" clothes in one and then bought heaps of clothes and jewellery as well. This jacket is absolutely gorgeous in every sense of the word. 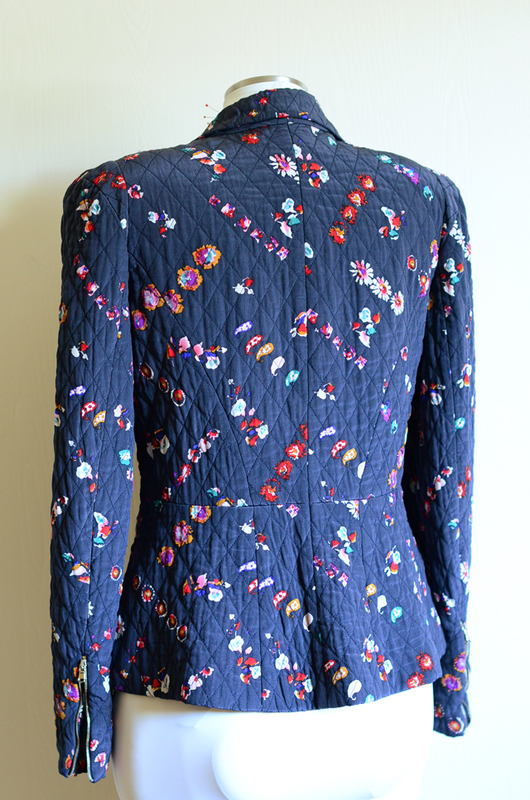 Its an amazing jacket and the quilting is such a neat feature. It's gorgeous! What a great find. I can't believe it's 100% silk. More and more I look at designer labels only to find the garment is polyester or some blend. And for outrageous prices! It's really lovely. One (or both) of those outer layers of fabric can be made up of pieces sewn together; that's often called patchwork or piecework. 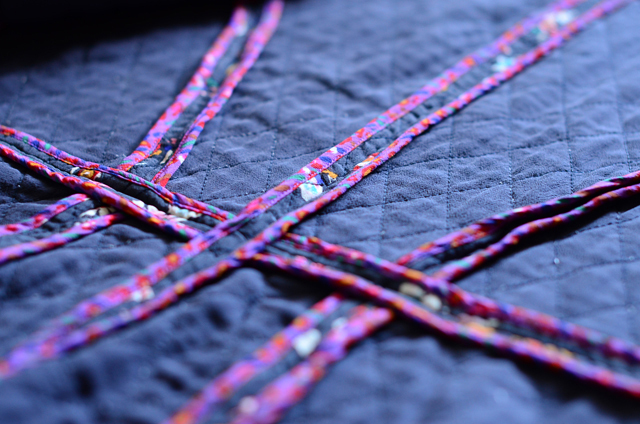 Wholecloth quilts are just that: not patchwork but a single piece. And older wholecloth quilts, especially French ones made for the upper classes, are often silk. 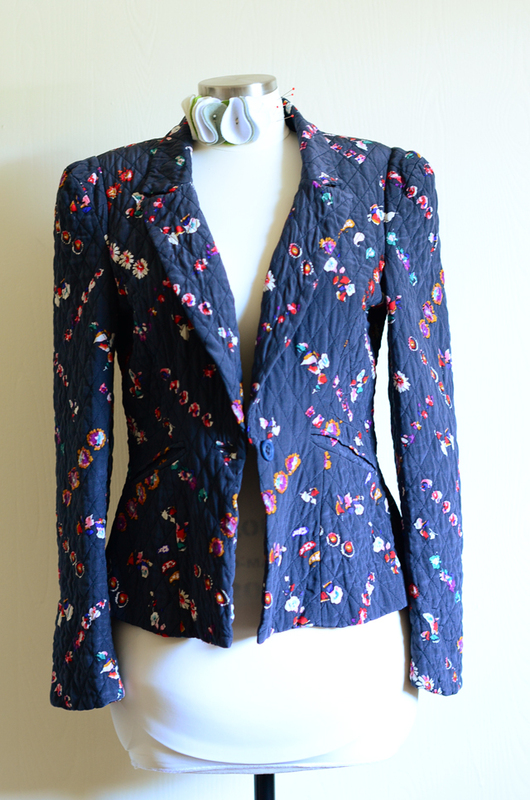 That said, it's a gorgeous jacket and a wonderful find! Goodness, what a great find!! I was sucked in right at the first picture. Interestingly quilted garments are something that I've seen very few times. The only example I have in my wardrobe is perhaps an almost-as-surprisingly-unique vintage quilted robe that's rayon! Not only that, it's reversible: quilted on one side, plain on the other. It kind of is something that still boggles my mind when I think about it. Sunni, that's a great jacket. I love those Hong Kong seam finishes. But the real reason I was writing you is to say: I love the new blog design. I must admit I normally read your posts via Feedly...but today I popped over to send your princess seam tutorial link and I saw this beauty. So clean, so stylish. Would you mind telling me what fonts you used for header/banner? Congratulations again! I can't see the sleeve cap "curious addition" that you reference. Can you post another picture? Wow. This jacket is pretty awesome. We are making jackets in design class and I think these hong kng finishes would be awesome instead of lining it. I'm kind of in love, and a tad jealous. Great find! So beautiful! Especially those Hong Kong finished seams. I've honestly thought a lot lately about making a silk Victoria Blazer because I have the most beautiful fabric (although not the skills at this point). This just makes me want to make one more! And maybe try a quilted jacket? Great find! Quilted jackets were very popular for evening in the 1940's. Now if they were silk or not I guess depended on what country you lived in, what time of the war, and how rich your were, but many of the big-sholdered evening jackets were quilted in luxurious looking fabrics.